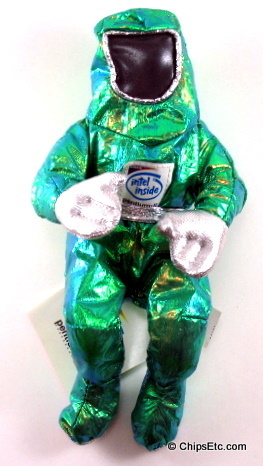 The Intel Bunny People characters and dolls were modeled after actual Intel clean room technicians that first started wearing "bunny suits" at Intel's Fab 3 facility in Livermore, California back in 1973. 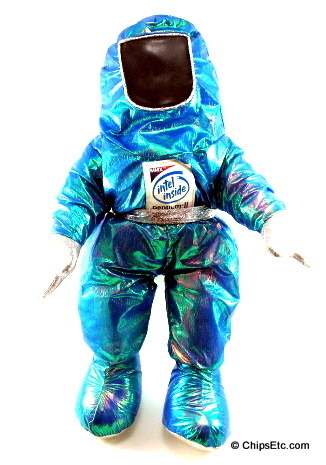 By 1980, all Intel wafer manufacturing sites would be using the clean room suits as standard protocol. 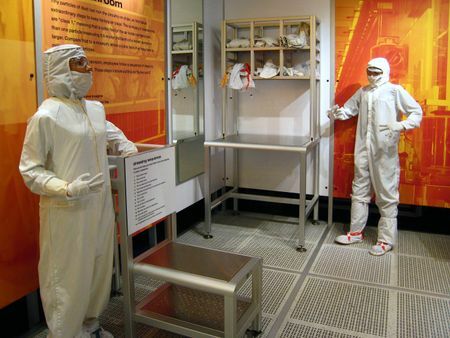 The bunny suit covers the worker to prevent hair and skin particles from being shed into a clean room environment which could ruin the microscopic circuitry of a computer chip. 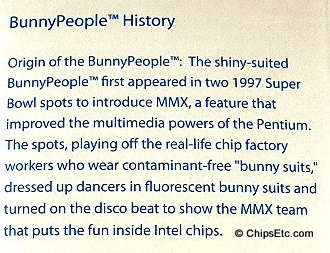 The Intel Bunny People characters themselves first appeared on January 26th 1997 during two new Super Bowl XXXI commercials that were designed to introduce the public to Intel MMX technology, a feature that improved the multimedia powers of the Pentium II chip. 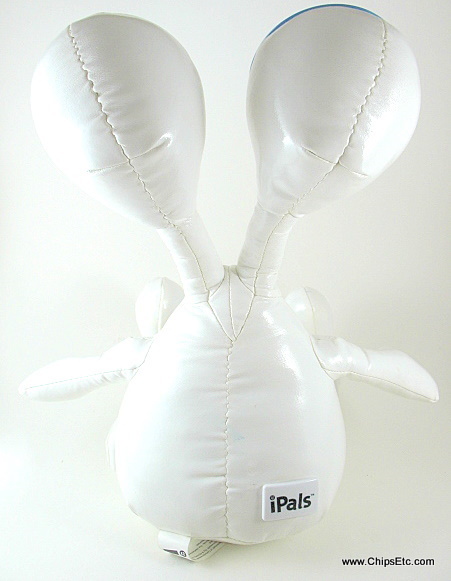 The dancing Bunny People commercials were so popular with the public that Intel decide to expand the Bunny People marketing campaign and create the plush, bean bag style Bunny People dolls. 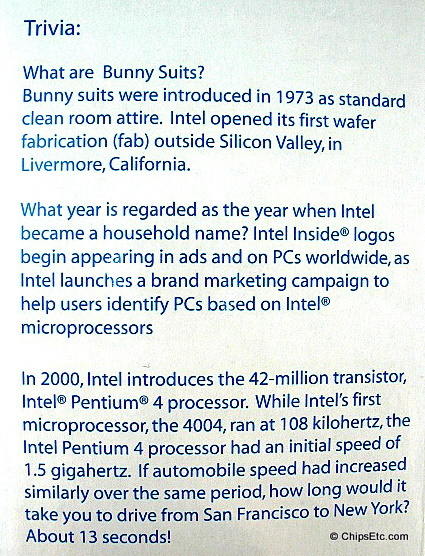 The Bunny People have been one of Intel's most successful Ad Campaigns. 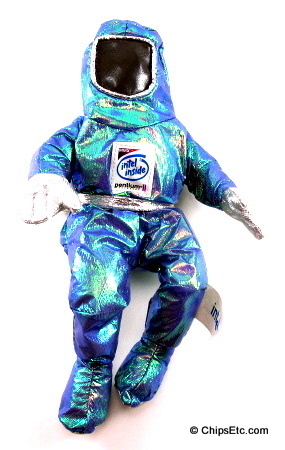 By the Spring of 1998 the Bunny People dolls would become a standard item for sale at all the Intel employee stores and were extremely popular with employees lining up to get one for themselves and as gifts. 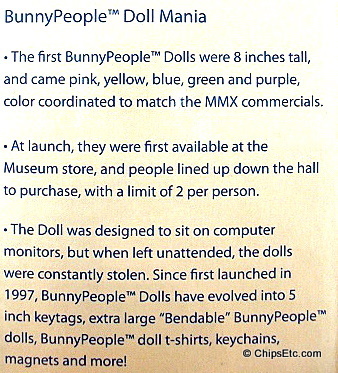 The Spring/Summer 1998 Uniquely Intel gift catalog shows the various sizes and colors of BunnyPeople dolls offered for sale for the first time. 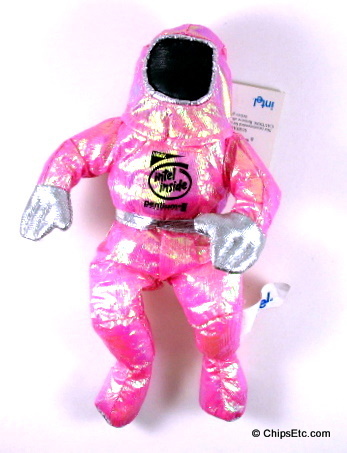 The dolls were also made available for sale to the general public on the America Online (AOL) website around this same time. 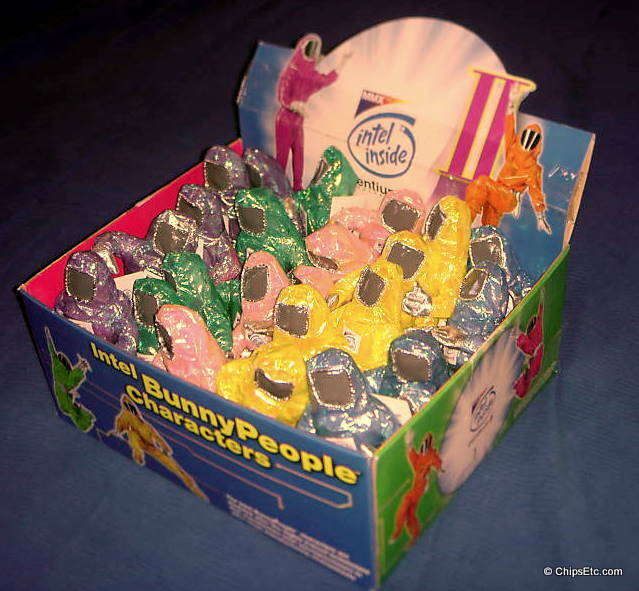 Ever since the dolls were first released back in 1997 Intel has not stopped offering the popular BunnyPeople dolls as promotional gifts, though the dolls styles have changed from year to year. 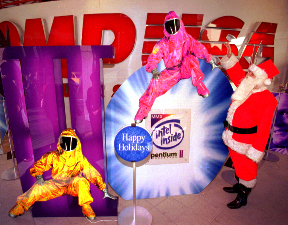 "Intel Gets Hopping on BunnyPeople Sales"
"Barbie may have a little competition from computer chip maker Intel Corp. this holiday season--the company is selling dolls of the bunny-suited clean-room workers featured in its ads. 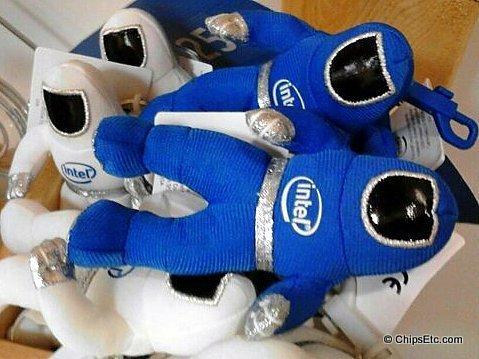 Users logging onto America Online have an option to purchase one of the 8-inch-tall Intel BunnyPeople featured in television commercials, seen dancing to 1970s disco hits or with the Rockettes in New York, for $6.99 each. 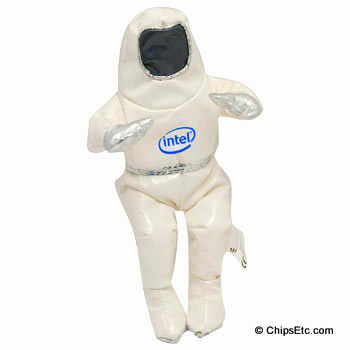 The BunnyPeople dolls, like the ad characters, are modeled after the technicians who make Intel microprocessors in ultra-clean rooms, wearing "bunny suits" as protective clothing. 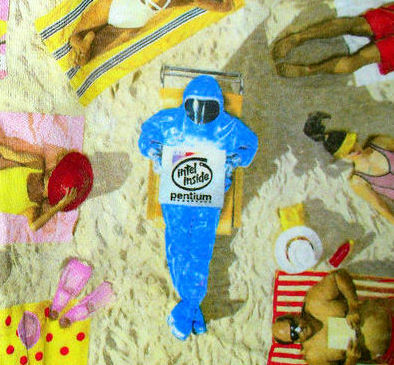 The suits, which look like something out of a 1950s science-fiction movie, prevent even the smallest dust particles from contaminating the complex computer chips. 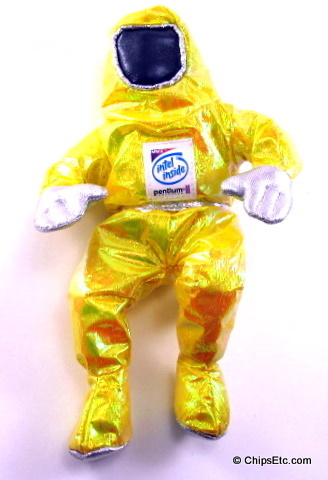 An Intel spokesman said the dolls were originally created as something to sell in the Intel company store as a kind of company mascot and for promotional giveaways, because a teddy bear just did not seem appropriate." 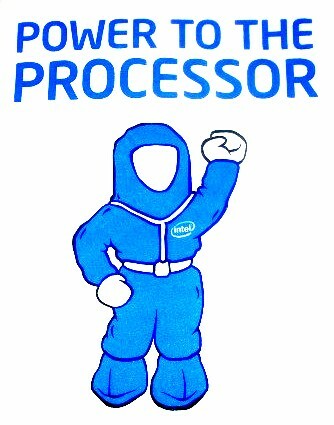 "The BunnyPeople characters are modeled after the highly trained technicians that manufacture Intel micro-processors in ultra-clean manufacturing environments. 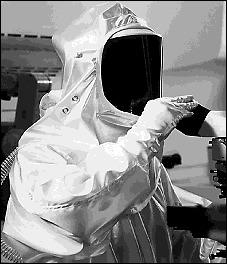 Wearing a "bunny suit", protective clothing which prevents even the smallest dust particles from contaminating the microprocessors being manufactured, these technicians manufacture highly complex chips." 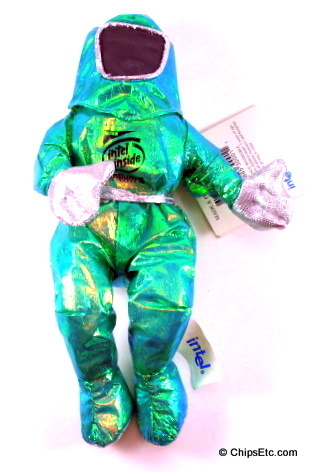 The original Intel BunnyPeople dolls were 8 inches tall and came in 5 luminescent colors : Shimmering Luminescent Blue, Green, Yellow, Pink and Lavender. 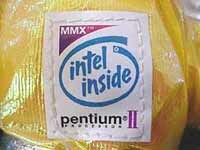 They were filled with bean bag type material inside and came with a cardboard hang tag with information about Intel's clean-room worker's suits (known as Bunny Suits) and also information about Intel's Pentium II processor w/ MMX technology. 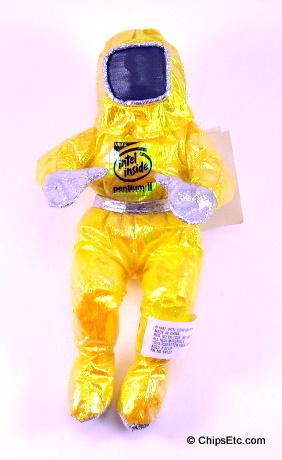 The very first dolls released in December 1997 had clear labels with black lettering and logo on the doll's chest. 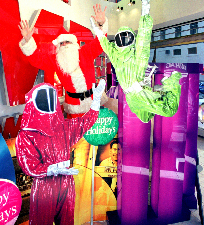 Shortly thereafter, the dolls would be produced with white labels with various color graphics and lettering. 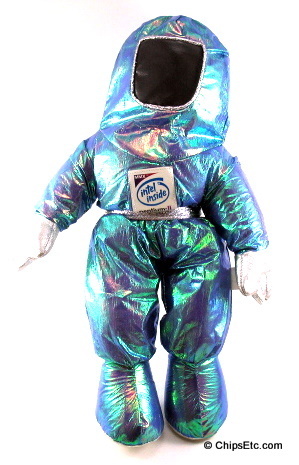 Later dolls came in larger sizes (14") and also were available in additional colors, including black and white, and some dolls featured add-ons such as laptops in there arms or clean room air packs on their backs. Later dolls became available in colored vinyl and fabric as well, the original dolls were made only of a thin pearl and luminescent material. The large versions of the dolls are 14 inches tall and the small ones are 8 inches tall. 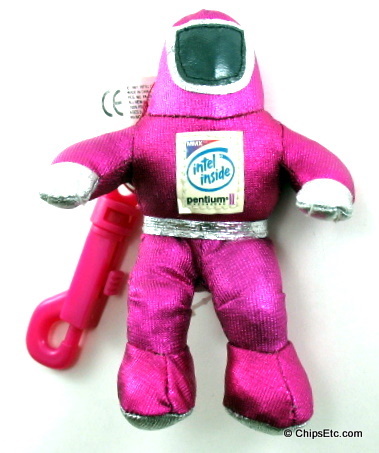 The keychain tag dolls were 4 inches tall. 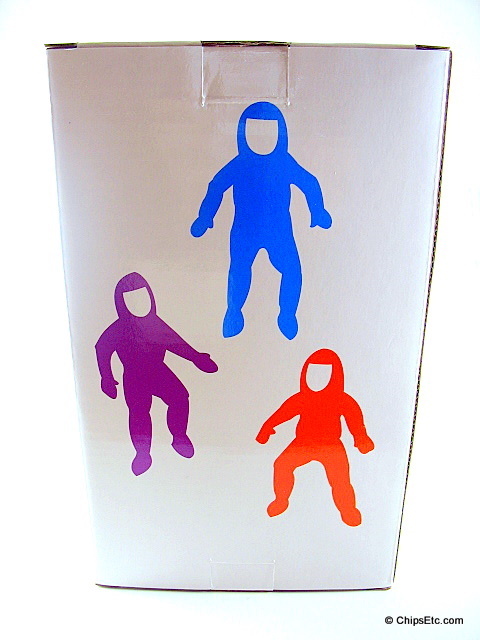 The IntelStore also briefly sold some extra-large BunnyPeople dolls that were over 3 ft tall (36"), they came in dark and light blue fabric, and also in metallic blue or purple material. 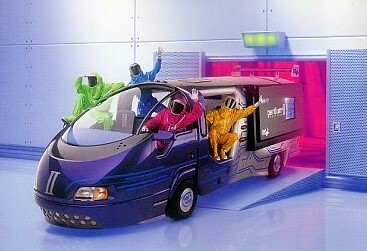 These were produced briefly and had a very limited production run. 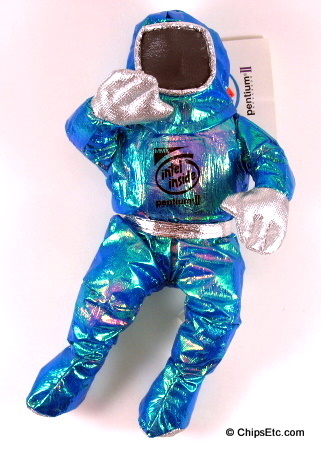 They were not big sellers due to their higher price tag than the smaller, more popular, 8" gift dolls. 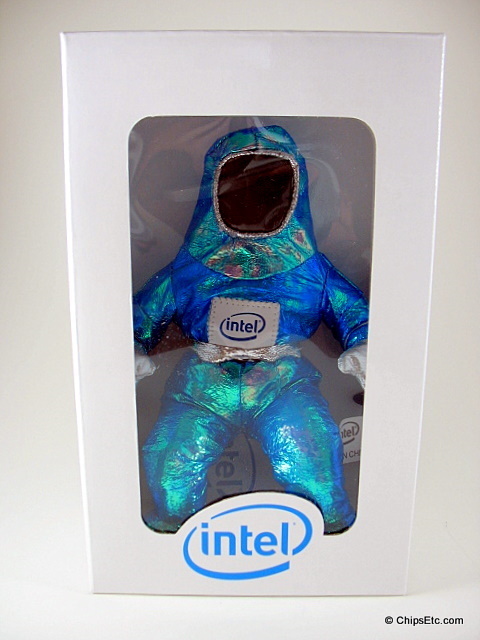 In 2009 an 8" "binary graphics" version was available as well as a 8" shimmering blue "collectors version" doll that came with a collectors box that had Intel BunnyPeople history and trivia information on the box. 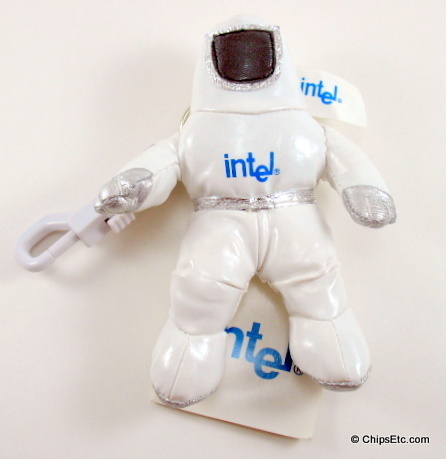 This "collectors" doll was the only version of the Intel BunnyPerson dolls ever issued with an accompanying box, all others were sold loose with just information hang tags attached. 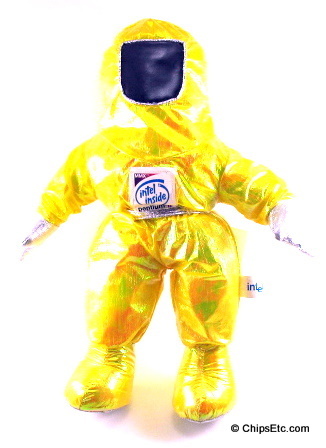 An original "clear label" BunnyPerson doll given away at the CompUSA Pentium II launch events in December 1997. 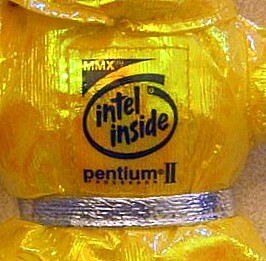 Pentium II with MMX labeled BunnyPerson doll in the larger 14" size. 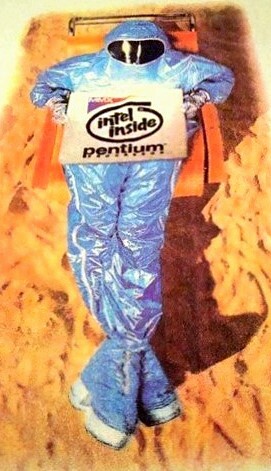 Pentium II with MMX labeled BunnyPerson doll in the original 8" size. 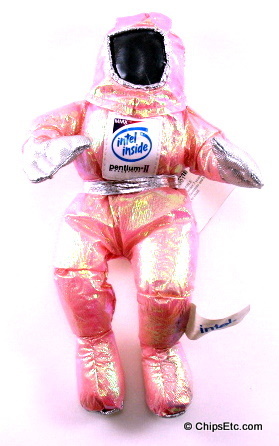 "Intel Inside" labeled BunnyPerson doll in the 4" size. Has a plastic keychain clip attached. 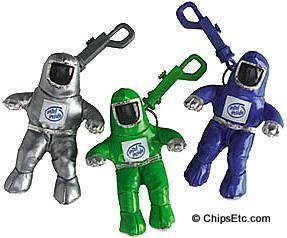 This is a 3 pack assortment of "Intel Inside" labeled BunnyPerson vinyl keychain dolls in the 4" size in lime green, blue & silver colors. Each has a plastic keychain clip attached. 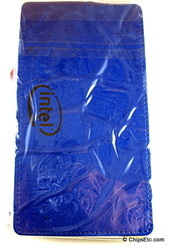 New unused in sealed poly-bag. 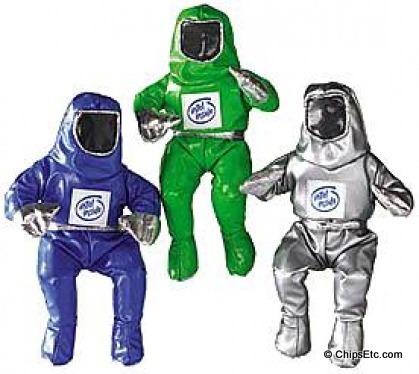 This is a 3 pack assortment of "Intel Inside" labeled Bunny Person vinyl character dolls in the 8" size in lime green, blue & silver colors. 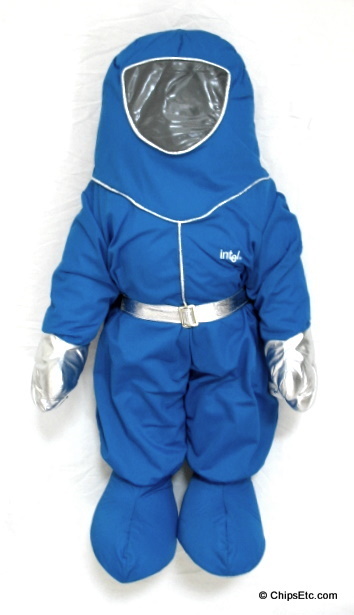 This is a 3 foot tall pose-able BunnyPeople doll in metallic blue with metallic silver belt, trim and hands. 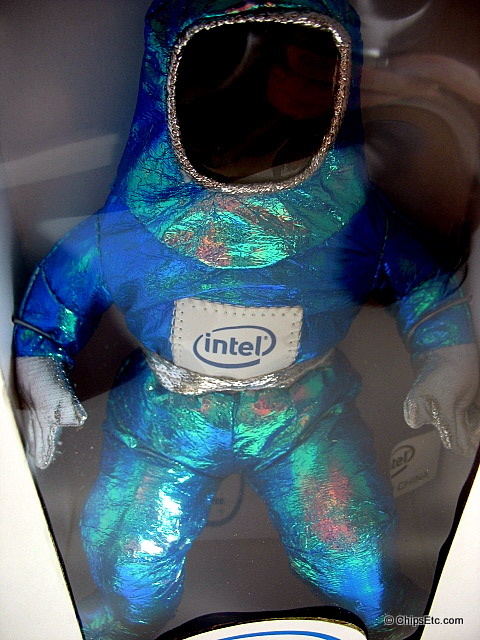 These extra-large dolls were only sold for about a year at some of the Intel employee stores. Due to their large size and higher price tag they were not big sellers and are no longer being produced. 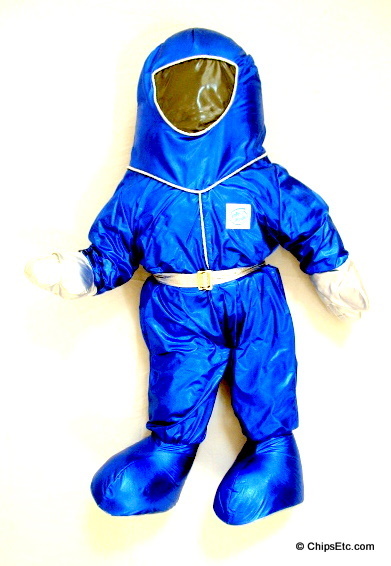 This is another variation of the 3 foot tall pose-able BunnyPeople doll in blue cloth with metallic silver hands, trim and belt. 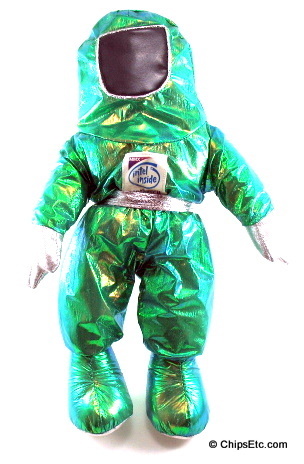 Limited production run, this size of doll is no longer being produced. 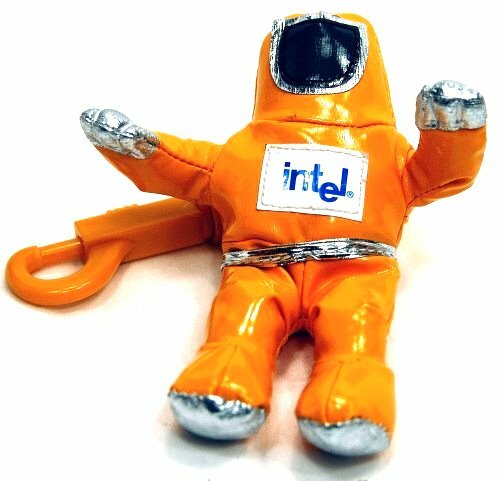 Intel "Dropped-e" labeled BunnyPeople vinyl keychain doll measures 4 inches tall. 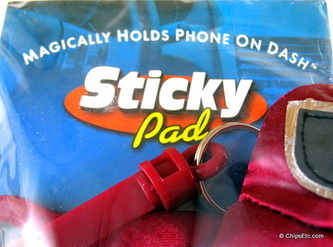 Includes Hanging clip and original Tag. 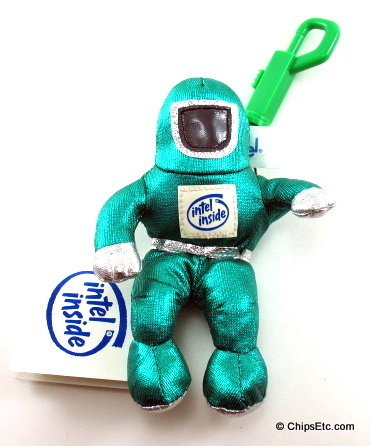 Intel Inside "Pentium 4" labeled BunnyPeople vinyl keychain doll measures 4 inches tall. 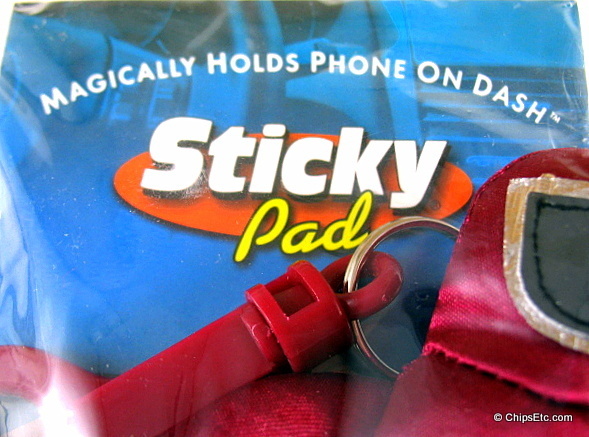 Includes Hanging clip and original Tag. 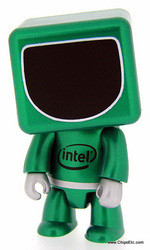 Intel "Dropped-e" labeled BunnyPeople vinyl keychain doll measures 8 inches tall. 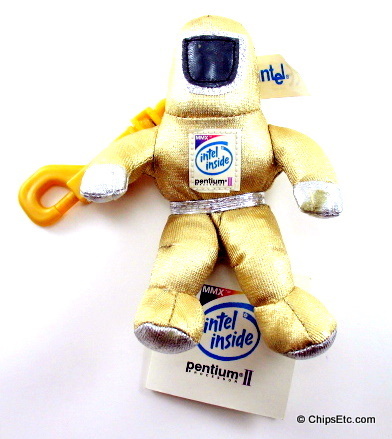 Doll has a cardboard hang tag that promotes the Pentium 4 processor. 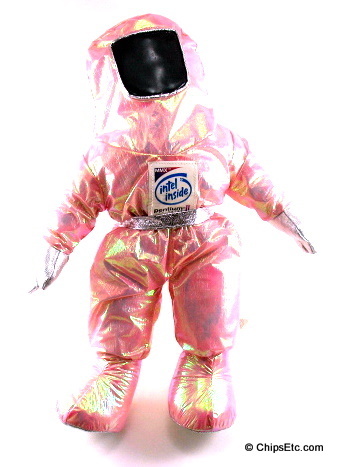 Intel New style logo'd BunnyPeople vinyl doll measures 8 inches tall. 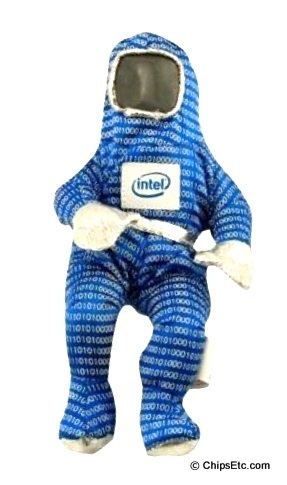 The Intel "Binary"version of the BunnyPerson doll has printed graphics with 1's and 0's. 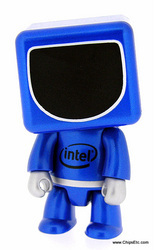 Doll has the new style Intel logo and measures 8 inches tall. 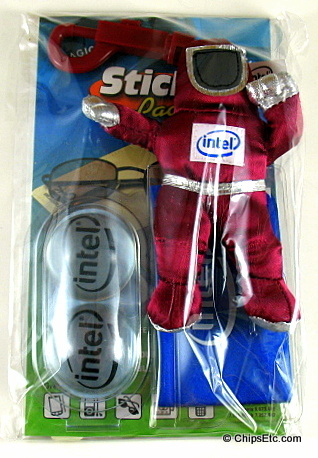 With the huge popularity of it's Bunny People character dolls over the years, Intel created this unique boxed edition for collectors in 2010. 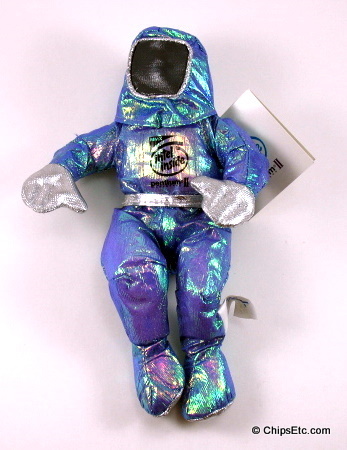 The 8" doll in the collectors set was only issued in metallic blue color. 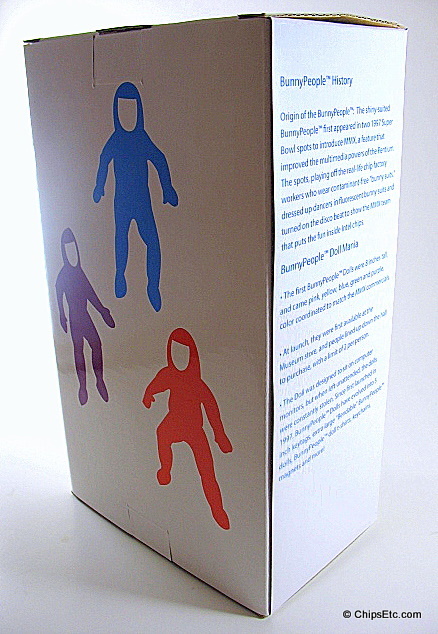 The box has trivia and history about the the Intel BunnyPeople dolls and bunny suits worn by Intel workers on the sides and back (click on pictures below). 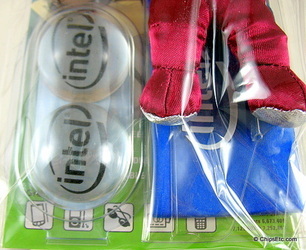 This promotional package from Intel features a 5" plush Bunnypeople character keychain, a sticky pad for mobile devices, and two Intel logo gel riser pads for laptops. A "Qee" is a limited edition, designer collectible figurine toy made by Toy2R in Hong Kong that are popular with adult collectors. 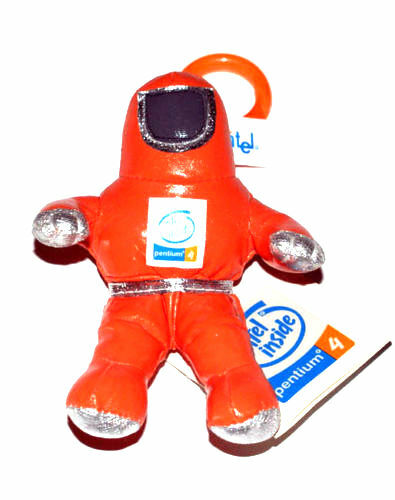 This Qee set contains four 2.5" tall keychain figurines that each have the Intel logo on the front and the associated partner company on the back. 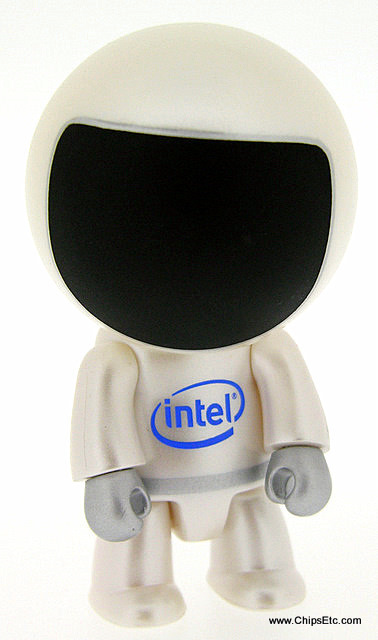 Each Qee represents one of the four different Intel computer OEM customers: Lenovo, HP, Acer & ASUS, each is a different color. 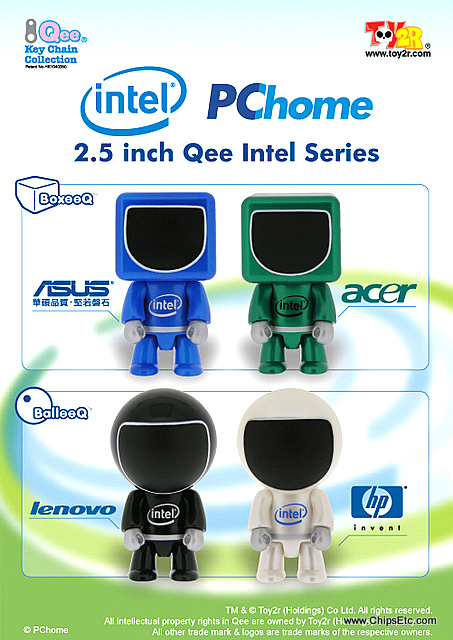 Their are two different Qee styles found in this set, the "Ballee" and "Boxee". 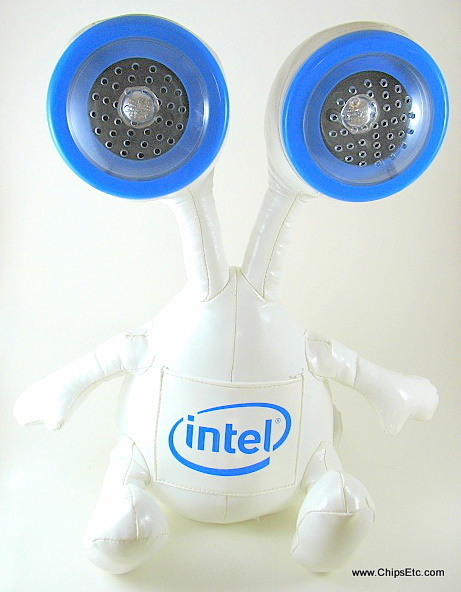 This set was a collaboration between Intel, Toy2R Qee, and Chinese computer retailer PChome.net as a sales promotion in 2007. 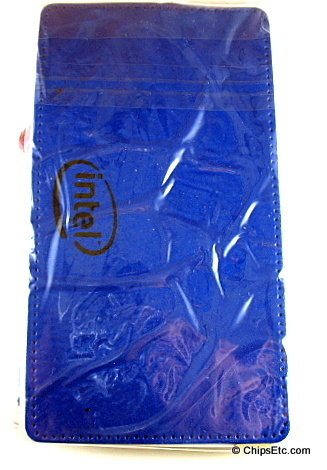 The production run of this Intel PChome Qee set was limited to only 1,000 pieces and was only available in Taiwan. 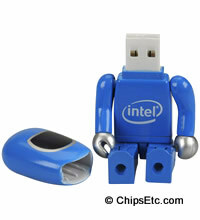 Blue Plastic USB flash-drive disguised as an Intel character. 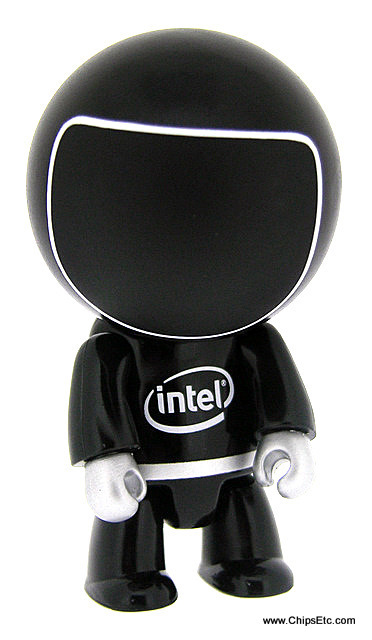 The character is pose-able and the flash-drive is accessed by removing the characters helmet. 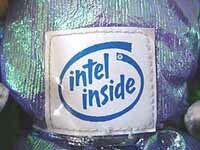 Has the new style Intel logo in silver. iPals are a soft, pose-able alternative to those ordinary speakers in the market. Available in many fun colors. iPals speakers provide a clear, rich sound through a built in amplifier for your Apple iPod, desktop computer, MP3 player or CD player. Bendable eyes are actually directional speakers. 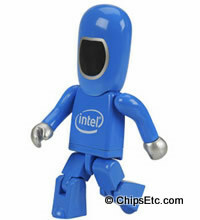 This Intel logo alien character doll has a plug-in for Apple iPod or other music players. 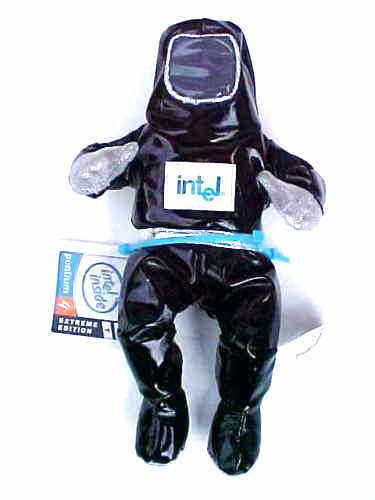 Soft, stuffed vinyl Intel toy has the company l logo on front. 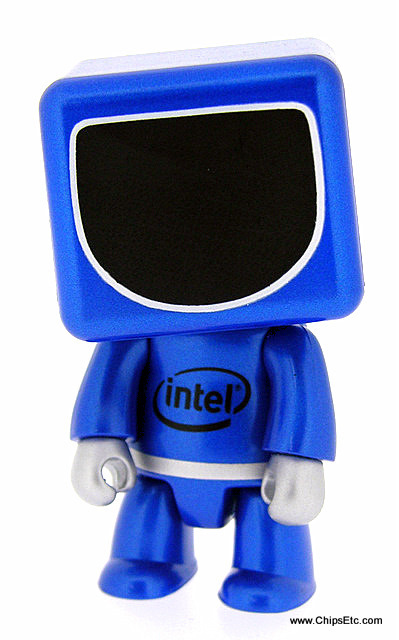 This item version of iPal was made for Intel and had a very short production run in 2008. Item #315 & 316 are New, Unused with hang tag in original box. 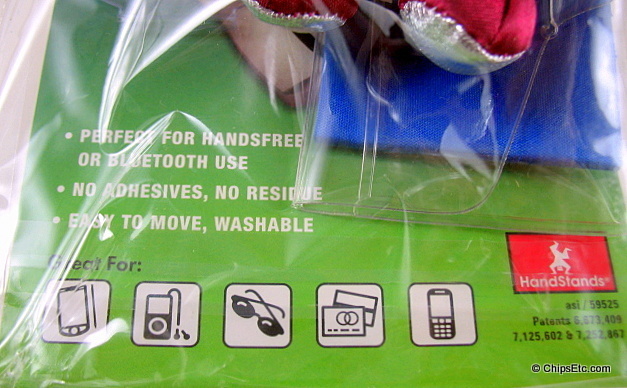 Item #600 (shown) is lightly used with no hang tag or box.